Fig. 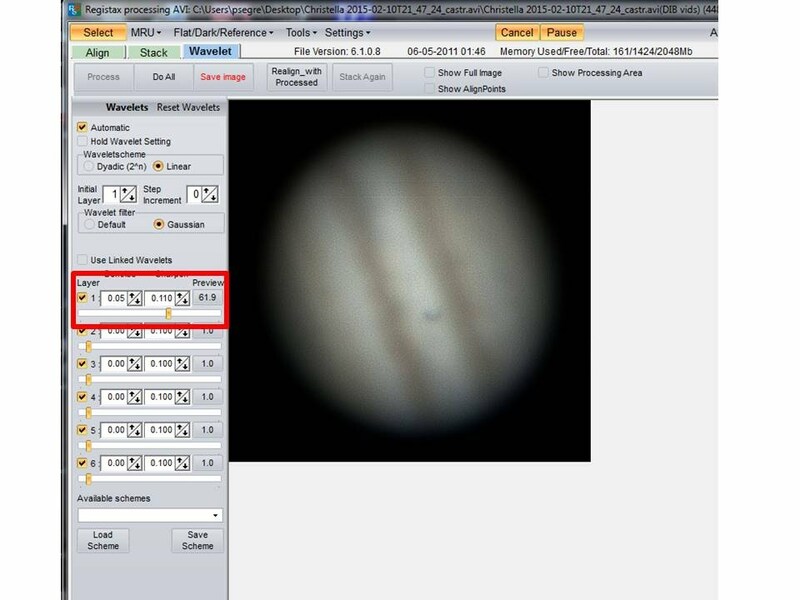 1: Example of the difference between Jupiter's appearance in the raw .avi movie file (left) and Jupiter after processing the movie file through Registax (right). Examine the quality of the individual frames of your movie by grabbing the yellow slider bar on the bottom and scrolling through all of the individual frames that make up the movie. Are all of the frames equally sharp? To begin the process of stacking and sharpening the individual movie images you must first tell the program where the center of the Sun is. To do that, click the checkbox Align by Center of Gravity, then click once on the red circle that appears in the middle of your image. Now on the upper left side, click on Align. This will automatically align and stack your images together. Once Registax is done processing, you should see one semi-blurry image on the screen. In the next part you are going to brighten and sharpen this single image to get your final result. To Brighten the image: On the upper right side, click on Histogram, you will get a box like that in Fig. 2. Now do two things: a: Click on the Direct Box and b: Move the right side slider bar until it is just to the right side of the "mountain". Fig. 2: To make the image brighter: a. Click on the Direct Box and b. Move the right side slider bar until it is just to the right side of the "mountain". Fig. 3: To sharpen the image: Move the slider in Layer 1 to the right to sharpen the image. If you are happy with the image on the screen, click Save Image on the upper left corner, then put the image one a powerpoint slide.